Consumer experience is at the heart of the media and entertainment industry. Companies looking to gain a competitive advantage in the digital world must create unique and dynamic experiences in order to drive both customer acquisition and continued retention. Redis is the datastore of choice for businesses in these industries, especially for supporting real-time scenarios such as highly personalized interactions, content caching, user session management, scoring, ranking, leaderboards, social engagement, messaging, notifications, real-time analytics and high-speed transactions. Media and entertainment companies rely heavily on Redis because of its extreme efficiency and versatility in delivering real-time engaging experiences at scale and with minimal resource consumption. 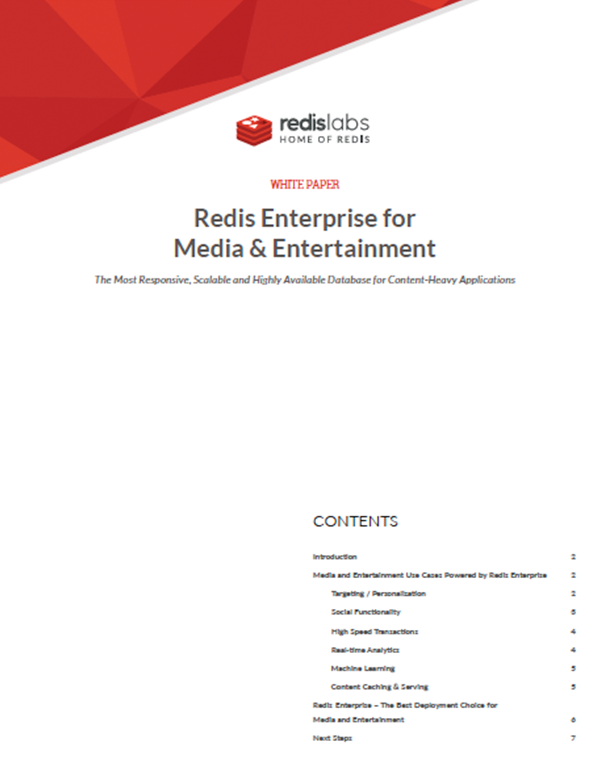 Redise – Redis Enterprise from Redis Labs – meets the mission-critical needs of the media and entertainment industry by increasing availability and substantially simplifying the process of scaling deployments in a range of cloud and on-premises environments. Learn more about how Redis provides the unbeatable competitive edge to media and entertainment companies.